Appearance of imperfection on your skin is really one of the major concerns. With emotional as well as environmental stress it is natural to experience these skin imperfections. 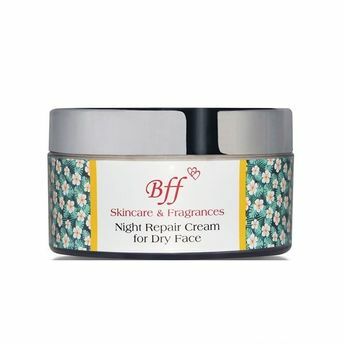 BFF Night Repair Cream is ideal to penetrate quickly as well as fight with the wrinkles, lines, and other visible stress signs. Your skin looks nourished, fresh and soft after waking up in the morning. Aloe Vera: Has more than 75 nutrients and 70% water content that treats different types of skin and gives an even all glow to the skin. Ginger: Has 40 different antioxidants that invigorate and stimulate the skin.